Walking to Leon through the meseta. Alright, I'll admit it: I have cried now on the Camino de Santiago. They say that the Meseta, like its landscape, lays everything bare. Guess I can say I've had the authentic Meseta experience. The Meseta traditionally starts in Fromista. 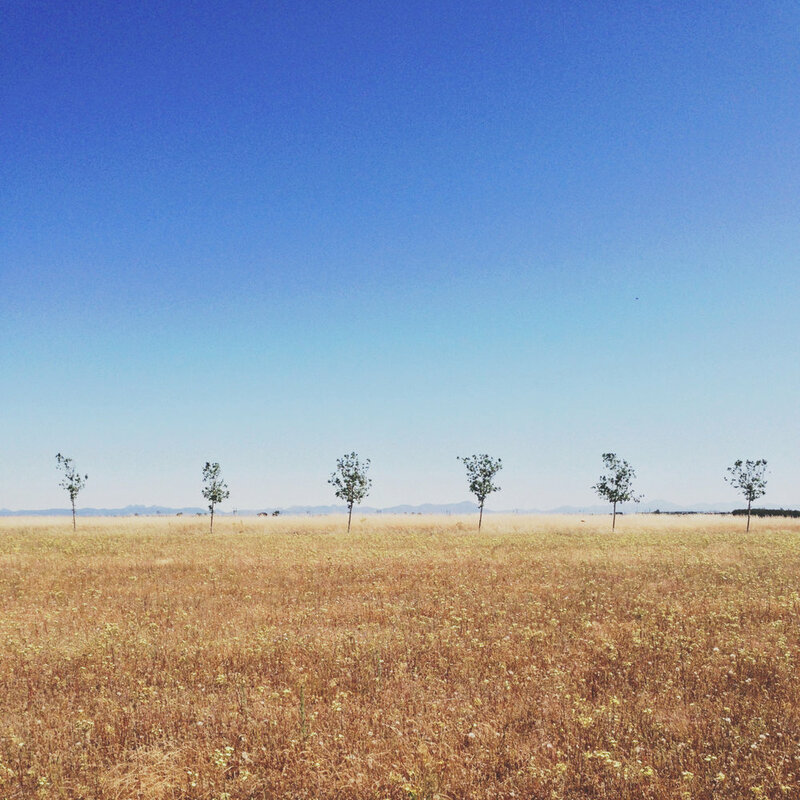 The land is flat, almost treeless, and very, very hot. I think the heat gets to people even more because there isn't much to visually distract you from how you feel. Yes, fields with lone small trees have a striking beauty. But when that's what you're walking across all day, it can get monotonous. You see other pilgrims break down in ways you don't see on other parts of the Camino. Bugs bites become an issue. One Irish pilgrim had such a bad reaction to Spanish mosquito bites that her arms swelled up in giant welts. She had to go to a doctor and go home. A Finnish pilgrim got stung by something on her face. Her Camino ended as we'll. It's humbling when the hazards of life become things you can't control. As we continued across the Meseta, I noticed how Spain's economic problems were "laid bare" her as well, with no romanticism for it to hide behind. In one town, the only patch of green was the grass in the albergue courtyard. The rest of the town could have been a ghost town. On the way to Terrafillos de Los Templarios, I started to feel sick. The next day, on the way to Bercianos, I thought my stomach would explode. Something was wrong, but I wanted so badly to muscle through. I thought that if I rested and drank enough Gatorade that night, I'd walk again the next day. But I am not Supergirl. You remember French Yoda, right? The albergue owner in St. Jean-Pied-De-Port? He had looked at me and good me that I am not Supergirl. I had smiled, nodded. Guess that simple statement feels more real now. A Dutch couple was cutting their Camino short because the wife hurt her ankle. They were taking a taxi to Leon, the nearest city, where they would fly back to Holland. I could meet Gabriela in Leon and get medicine. Even though it broke my heart, I got in the taxi. So I cried. I hate to admit it, but I feel like it's important. Rest and medicine have done me good. Lauren and Ron will arrive in Leon today, and I will continue with them. If you could suddenly document your entire life, what would you choose to document? Would it only be important moments? What are important moments to you? What if you paid attention to the moments of your day so that you noticed its beginning, middle, and end? How many combinations of moments could you put together to tell the story of your day in different ways? These are some of the thoughts going through my head in the quiet moments of walking the last couple days. In Burgos I stayed in a hotel with Gabriela so we could look through all the footage shot this far. Alburgues (the special hostels only for pilgrims) turn the lights off and lock the doors at 10pm, so by the time you get there, get clean, prep for the next day, and film, if doesn't give you much time to look over footage. So that's my reasoning behind my night of "cheating" on the pilgrim life, as Ron said. Anyway, looking through all the footage set my mind on these questions. None of us have made a movie quite like this before, but two weeks in, we're all noticing patterns in the moments we gravitate towards. Lauren gets excited over "intersections," as she puts it, that moment when a few disparate elements come together to create a unique moment. Ron gravitates towards simplicity, the beauty of a line tree in a field, for example. And me? I'm all about details and conversations. I get excited when a tree blows in the wind just right, when I notice a ribbon left tied around a statues's wrist for no apparent reason. In interviews, I live for the moments when interviews morph into full-blown conversations, when everyone's words start overlapping because they can't wait to share their thoughts. So here we are, bringing our instincts together to create a document of life on the Camino. Once you start paying attention to all the subtle textures that make up your day, it's hard not to shoot everything. Walking out of Burgos, I could have stopped a hundred times to document something beautiful. But there's also this very practical side to our lives right now. We have to wake up and walk at least 13 miles every day, and if you spend all your time shooting you'll get to the alburgue late and not get a bed. So how do you choose to tell your story? Today we decided to have someone take a picture of us together as a crew, since we're often not together in photos. In the only picture that turned out, I am making this strange alien face. I think I was trying to get breadcrumbs off my lip. No one can blackmail me if I voluntarily put this online, right? 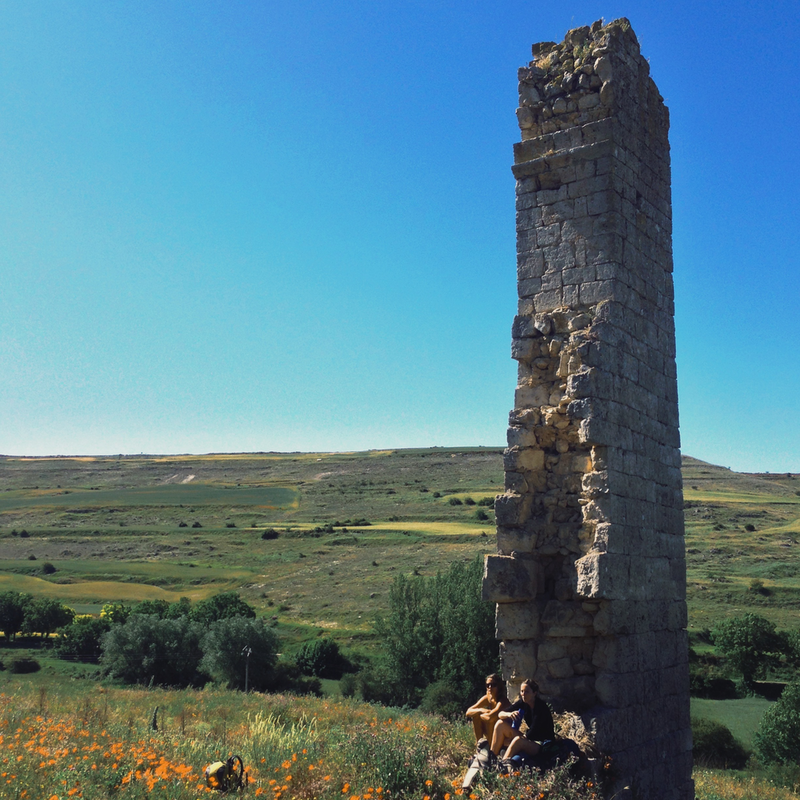 We hit the 204 mile mark today, walking through the ruins of San Anton towards Castrojeriz, where we discovered food left out for pilgrims and words of encouragement in different languages. This post was written by our wonderful team member Gabriela Quiroz. This morning, I met an Australian woman at the bus station. Her eyes swelled with tears when I asked her if she was walking The Camino alone. She replied “This is a path you must travel alone.” I knew she wasn’t talking about the actual road. I’m not physically walking the Camino of Santiago, I’m busing through it, going from town to town, meeting with the team every few days. I’m a production office/DIT station on the move. During my time in the different towns, I meet wonderful people; the big smiling lady at the bakery, the friendly hostel manager, the nuns that hang out at the icecream place, the woodcarving artisan at the end of the street. But most importantly, I meet pilgrims from all over the world, some of them have to stay behind due to a physical injury, others, are just taking a pause or have just arrived. What I see, from the pilgrims I have met, and what makes this trail different from the other trails in the world, is that this is the Camino of the broken. Here, most of people aren’t necessarily looking to achieve physical fitness or receive the favor of some saint. These people walking The Camino, most of them over 40, carry a heavier weight than that of their backpacks; they carry years of heartache, disappointment, and loss; sharp clawed demons that have been holding on to their backs for too long. I feel humbled by meeting people twice or three times my age who have so much to share. It is their openness what has made me rise to the challenge to walk this path as well. So, here I go, walking my own Camino, my heart as raw as theirs. Broken but filled with hope. The heavy burdens that weight us down will succumb in this road because the road is long and the weight has to fall. Demons buried under the rocks, we will come out the other side traveling light; transformed. I've been thinking a lot about storytelling lately (guess that makes sense, right?) There are so many ways that we're telling stories throughout the day with this film... Shooting the landscape, shooting interviews with pilgrims, shooting interviews with each other, writing notes for the film, Instagramming, blogging... Each format is different, each format helps give you an idea of what is happening as we cross Spain on foot seeking stories. But all of these, no matter how comprehensive we might try to be, will ever give you a complete view of the experience. Our days probably seem romantic, of adventurous, or maybe even perfect to you. But they are so far from that. Yes, some days, some moments are wonderful. But there is a lot that doesn't end up on the blog, a lot that isn't captured by a snapshot on Instagram. Every moment isn't magical. The night Veronique sang Edith Piaf in the cathedral? The last few kilometers of the walk that day were along a busy highway, and my only motivation to keep walking was the thought that the sooner I got to Belorado, the sooner I could take a nap. And yes, we are walking almost 500 miles across a foreign country as we make our first feature film. That probably sounds pretty epic. But I promise you, we have aches and pains. We smell bad at the end of the day just like every other pilgrim who walks this road. There are moments when I feel doubt, moments when I think "This is crazy, right? 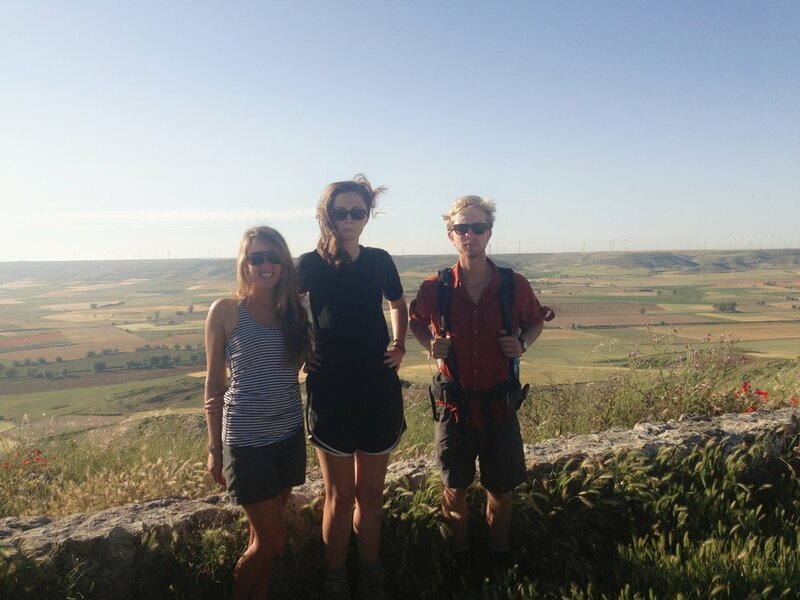 What in the world am I doing, backpacking across Spain and trying to make a movie?" The reason I'm saying all this? Partly because I've realized that I get discouraged when I don't have something particularly epic to share with you, whoever you are, that reads this blog. And that's stupid. This is real life, warts and all, and you know what? Even in my life apart from the Camino, there are beautiful moments amidst all the normality. There are things to be thankful for, stories I could share. We all have them. It's easy to just show the epic moments in our lives through all these various social media outlets. But that can give us a warped perception of the people we see online. 1. If you feel like you're life is currently boring, look closer. I bet you have at least one interesting thing happen every day. You should probably share that. More people want to hear than you probably realize. 2. If all you do online is share the epic moments of your life, figure out what you should do instead. I can't really say what that looks like. It's up to you. But I think the best stories are the imperfect ones. You don't have to be perfect. You just have to be alive, really alive. Alright, sermon/blogging thoughts over. Hold me accountable alright? I want to live real life with you guys, warts and all. Writing about day 14 from our day 15 final destination. Last night I couldn't charge my phone, but there wasn't any WIFI access anyway (because the man running the alburgue had forgotten the password.) Walking out of Burgos, you could start to feel the weather change. The land is flattening out, but we still have rolling hills. The long grass waving in the wind reminds us of Oklahoma or east Texas. In our final destination of Hornillos del Camino, we hung out with friends from Austria, Japan, and Germany, and interviewed our friend Lisa, from Denmark, who we've been traveling with for a few days now. She's been in quite a bit of footage already (she experienced the wonderful weirdness of San Juan de Ortega along with us, after all), but last night was our first real interview. I won't tell you about it all right now (the movie has to have some surprises after all), but suffice it to say that Lisa is pretty darn awesome. I would like to preface this account of the strange events in San Juan de Ortega by mentioning that a bumblebee rode on my shoulder about 4km through the forest until we reached the clearing that led to the town. At that point the bumblebee flew back into the forest (the truth of this can be vouched for by Tara from Finland, who also saw the bee.) That bee knew what he was doing. Calling San Juan de Ortega a town is using the term "town" loosely. It's an old stone monastery that now houses an alburgue and a bar. Across the street is an Internet cafe in a wood shack that offers Internet on desktops for a few euros. There was no WIFI, which has become crucial for our cheap communication with the outside world. But we were tired, and the thought of walking further sounded worse than just staying here. So we paid for our beds and headed to the bar to see what food was available. We bought three beers and some toast in a bag (yes, that tastes about as good as it sounds) and sat outside. Every pilgrim staying in San Juan sat on that patio. It felt like some strange adaptation of Casablanca, none of us belonging, none of us having anywhere else to go. We talked with Bob from Lebanon, who jokingly told us that the Mass that night at the monastery was the best show in town. He also said that it featured garlic soup for the pilgrims, and that all this town needed was a horse to be a Western one-horse town. I kid you not, moments later a cowboy rode into town on a white horse. Needless to say, we took Bob's word on the soup. After resting and cleaning up as much as is possible for a couple dusty pilgrims in an hour, we walked towards Mass. The cowboy, who was nearby with his white horse, called over to us. It turned out the cowboy was from England, riding across Spain as part of an organization that raises awareness for local solutions to larger economic problems. Offended when I asked his horse's name before I asked his, he told us that the horse was named Martin, and he was named Dean. The horse used to be named Fermin, but ladies apparently tell Dean that he looks like Dean Martin, so he thought the name change was appropriate. We went to Mass. It was a beautiful Mass. I could appreciate its beauty, even though I am neither Spanish or Catholic. But there was no garlic soup. After Mass we tried to eat dinner with our friends, but the man who ran the restaurant (and the alburgue, and served as the mayor of San Juan de Ortega, in fact) told us we could not put tables together. We would have to eat in sets of four. We were presented with the menu, which had two options for dinner: tuna empanada with a side of cheese, or tuna empanada with a side of morcilla. "What's morcilla?" Lauren asked the waiter. He said something about pigs and stuck a finger on his arm, running it down the central vein to his wrist. Pig's blood. Morcilla was rice with pig's blood. All of us ladies got the cheese. Ron said the morciilla tasted like meatloaf, if he made himself forget what it really contained. The next morning, after much jiggling of the monastery doors so that they'd actually open, we walked to the next town for breakfast. As we ordered our cafe con leche, the woman behind the counter looked at us and nodded knowingly. "You have just come from San Juan de Ortega." Or possibly the Twilight Zone? My day was totally made by the most fantastic French woman named Veronique. She taught me about the birds along the Camino, taught me the name for "poppy" in a few different languages (the red flowers grow wild all along the Camino.) Then tonight in Belorado, when we visited the cathedral and discovered that the acoustics were amazing, she sang Edith Piaf's La Vie En Rose, because I had told her earlier that it was my favorite song. It was the first time that Lauren and Ron had ever heard the song, and I don't think it could have been more perfect. After all that, she said that I had made her so happy today, that I had blessed her. I'm not sure what I possibly could have done, but Veronique has magic in her. She made everything beautiful. There is power in a good meal. Tonight we cooked with other pilgrims in our hostel, and the conversations lasted long after the food. We talked about everything from God to movies to potato farming (yes, potato farming). I am amazed by the interesting people the Camino brings together. One woman we ate with was a primatologist and has studied orangutans in Borneo. I never would have guessed that this blonde girl from Michigan had lived in a place where the jungle had to be cut away every day so you could walk through, a jungle where you couldn't make regular paths because the constant foot traffic would turn it into impassable mud, a place where your clothes could literally rot from moisture if you weren't careful. And her stories are just the beginning. Everyone has amazing stories. Everyone has these beautiful surprises that you could never guess at in a thousand years, even if they don't involve exotic locales. Maybe the Camino just puts people in the right mindset to really listen. There is an affection that grows between pilgrims that is different than relationships in all our normal lives. But shouldn't we take the time to really listen to people more often? I hope I do once I get back to the states. Since we last talked, the Travel Light team has walked from Estella to Los Arcos, Los Arcos to Viana, Viana to Navarrete, and finally, today, Navarrate to Najera. Thats 194.1 km, or about 120 miles. It's a holiday in Najera, the day of San Juan. The streets are packed with people partying. It's strange, the pattern of life we've fallen into. Walking seems normal now. Home seems far away. Fewer pilgrims we know are at each hostel as everyone spreads out and goes at their own pace. Last night there were only five other pilgrims at our alburgue. Each day feels like two days... The half the day you walk is one, the half you recover, cook, and talk to others is another. So this is day 9. In Los Arcos, a German man named Rolf said that the Camino becomes an addiction. That you have to be careful, or these patterns will become a craving once you go home. We joke that we are like the Lost Boys in Peter Pan. Home feels like a distant memory, and we keep on walking. As of today, we've walked 116km, or 72 miles. Stretching and remedies for sore muscles have become more a part of prep for each day. We got some good interviews, Ron and Lauren have shot lots of stunning footage. Another day living life on the Camino. We were about 3km away from Estella when Lauren pointed out a small stone church on a hill. A battered sign at the base of a path leading from the Camino said that the church was built in 1020. I'm not sure why, but something came over me, and I knew I had to take off my sandals. We set down our packs and walked towards the church. The building had been abandoned. A local family burned a fire in a trashcan under the olive trees that surrounded the church. Two Spanish pilgrims slept under another tree nearby. The building was simple. Just stone on stone. There was no door, so we walked inside. Piled high on two altars, spilling over onto the floor, were hundreds of pieces of paper. Some came from notebooks, others were postcards, some were mere candy wrappers. On all of them were handwritten prayers to God. A few other odd items lay scattered on the altar... A child's stuffed tiger, a surgical mask, a long-dead rose. The scene should have felt creepy, with all the layers of dirt, no light except what leaked through the door entry. Anyway, I don't know if I was supposed to (or if rules even apply in abandoned churches), but I started reading the notes. One prayed for their child, a son with a heroin addiction. One asked that the people of the world would crave justice, not comfort. One prayed for the loneliness to end. The words of so many people for so many years seeking answers to the problem of pain was more beautiful than any golden altarpiece. And so I knelt in the darkness, because for the first time I couldn't help it. Today has been so good. We started out walking in the rain, but even the rain was beautiful. We're working better and better as a team. Everything feels more joyful, and we're noticing more details, playing more with our art as we go along. At the top of a mountain today, shrouded in fog, stood these metal statues. As Lauren started shooting them, I noticed they made different tones when you hit them. The impromptu music echoed over the hills, and became an accidental soundtrack to the moment. It might sound weird, but wait till you see what we got. It's very, very cool. We arrived at our hostel in Puente la Reina to discover a lot of our new friends staying there. And the price of a bed is only 5 euros. In short, it's been a good day. Oh, and we saw a French family who is walking the Camino with a donkey, to help with carrying the extra stuff they need for their young son. They're actually staying at our hostel, too, and just now, as I was taking a shower, I heard the mother with the little boy a couple stalls over, the little boy singing pilgrim songs in French. Well, I'm off to dinner and more interviews. We found a place that actually has vegetarian food, so Lauren can have some kale for the first time in a week. The hostels on his trail are very silent in the morning. Everyone wakes up and begins quickly, methodically, going about their business.... re-packing packs, rubbing Vaseline between toes to prevent blisters, filling up water bottles for the day ahead. Everyone gauges what they need, knowing they have about thirty minutes to be prepared for what could be ten hours of walking. Right now, this is happening in our Pamplona hostel. Lauren is making tea while I should be packing, and Gabriela is helping us double check that we have everything. My pack is almost done, so I felt validated in writing for a bit. Today we walk the furthest yet... 26km to Puenta me Reina. My muscles are stiff, but all of us have some pains now. All of us are a little sunburned, far more tan than before... All of us awkwardly stretch out our muscles whenever given the chance. My shoulders are the worst. We've done 44 miles. So just about 450 to go right? How bad could it be? Have you ever really watched city rain? The night sky on its own would make the streets reflect back blue, but all those street lamps, those puddles of sodium vapor light, make these islands of gold within the pavement. It's a different beauty than the mountains. But I like it just as well. Tomorrow we walk 26km to Puenta la Reina. Today has been restful, even though it involved a lot of work. We're starting to figure out a rhythm. I can't wait until all these new things feel like second nature. It's amazing what 3 days have done already. Today we walked from Lorrasoaña to Pamplona (a mere 16km after the long hikes of the last few days.) Again, we tried to walk with Michael, and again, we missed him, even though we were in time. As we ate our breakfast of bread and coffee at the small town market, we started talking to another group of pilgrims. It turns out they were divinity students from Alabama. We asked if we could walk with them, and began the journey to Pamplona. One of the guys in the group, Hunter, has done the Camino twice before. It's his dream to come back here after school and open his own hospitality ministry, feeding pilgrims for free and listening to their stories. We interviewed the guys over mid-morning coffee at El Horno, and their professor, Peter, started to talk more about the theology of the Camino. After a short time, he stopped. "Theology is best discussed over a beer," he said. We agreed to meet up in Pamplona tonight to have a beer and talk more about God. We got to Pamplona around lunch, where we met Gabriela at our hostel. It's great to only to hike for five hours after the last couple days. We took long, hot showers, and are transferring the footage from the past couple days onto hard drives. It's strange to rest, and be in a city after all the mountain villages. But I think my muscles are happy for the break.